Sam’s stress level is at an all-time high, and it’s affecting the quality of her Dear Know-It-All column—and her bedtime! Sam can’t sleep! 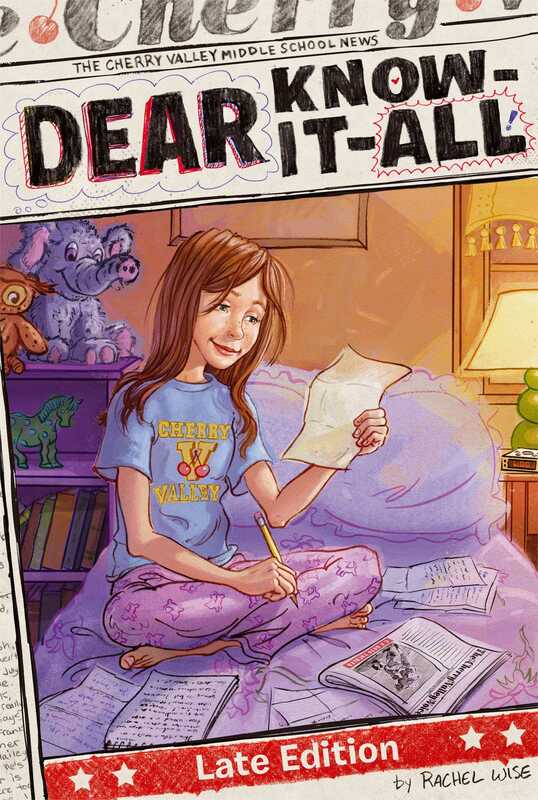 She has two book reports to write, plus a big science test, an article for the Cherry Valley Voice newspaper, and her anonymous Dear Know-It-All column…all due the same week. It’s too much, so Sam is stressing out. And it doesn’t help that her crush, Michael Lawrence, comments that the Dear Know-It-All columns aren’t as good as usual. Sam knows worrying won’t help, but that doesn’t keep her from waking up in the middle of the night. What can she do to get some rest from her stress? SUBURBAN TEEN DIES OF SLEEP DEPRIVATION! I rolled over and stared at the clock next to my bed. The numbers cast a bloodred glow across both the computer and the empty diet cola can on my bedside table. It was 1:05 a.m. I quickly did the math in my head for the tenth time that night: My alarm will go off at 6:15, which means if I fall asleep right this very second, I will still get only five hours and ten minutes of sleep. I sighed heavily and flopped on my back to stare at the ceiling. I’d read an article a few months ago on Huffington Post about teenagers and how their internal clocks are out of whack with the rest of society. I guess a lot of studies have been done and teenagers’ bodies need to stay up late and sleep late. (Like I did this morning. Blissful eleven-o’clock Sunday-morning sleep-in!) It’s some kind of adaptation that has developed over thousands of years. Maybe I should pitch an article to Mr. Trigg, our school newspaper advisor, on teenage sleep patterns. That could be good. I flipped on my lamp, wincing at the brightness, and reached for my laptop to e-mail the idea to myself. (My trusty notebook was already packed in my messenger bag and I didn’t feel like getting up to get it.) After closing the computer, I switched off the lamp and settled back under the covers with a sigh, waiting for sleep to come. I sighed again loudly and fluffed my pillow. Nothing. I wondered how fast it could happen. At some point I must’ve fallen asleep, but it was well after one thirty, because that was the last time I remember doing my sleep math. “Sammy, sweetheart, you’re going to be late if you don’t get up right now!” My mom sounded stressed. “Yeah, sweetheart!” sang out my sister, Allie, passing by my room—while texting, I’m sure. I groaned and thought about how I keep meaning to wear clean school clothes to bed so all I have to do is roll out and brush my teeth. Tonight. For sure. “Just put your feet on the floor. Once you’re up and moving, it will be a whole lot better. I promise,” said my mom, watching me with folded arms from her perch in the doorway. I did as she said and mentally reviewed my day, trying to figure out the soonest moment I could get some shut-eye, even if it was just a nap in the library. But I have a newspaper meeting, I’m helping my BFF, Hailey Jones, with her English essay after school (she’s a dyslexic math whiz, and I love to write and hate math—we are a perfect match), and I need to sneak by my mailbox in the newspaper office at some point to see if there are any letters for my column, Dear Know-It-All. I sighed heavily and stood up. “Okay, Mom. I’m up and it’s not better!” I called, but she had already left. Allie walked by going the other way now, fully dressed, laughing into her phone. “What kind of people talk on the phone at this hour of the day?” I grumbled under my breath. I rolled my eyes and began to get dressed. “I have lots of friends!” I called back, but of course she didn’t hear me. My mom was a little bit right, in that once my day was under way, I wasn’t as tired as I’d been all snuggled under my down comforter. Getting up in the morning is kind of like writing on deadline. You dread it, and it’s hard to get started, but once you get going, everything just flows. That’s how it is for me anyway. Maybe not for Hailey, though. We were at lunch and Hailey was fake banging her head against the table. ISP means Independent Study Plan, which Hailey gets because of her dyslexia. She also gets a tutor, but she prefers working with me so she cancels the tutor a lot. “Hmm, maybe I should get an ISP so I can write an essay for the math exam!” I giggled. “Why?” asked Hailey, picking up a glazed doughnut from her tray and chewing thoughtfully. Hailey’s mom is a health nut so in Hailey she has created a junk-food nut. “Like suddenly you were living in the wrong time zone?” asked Hailey. “Well, you’re lucky,” I grouched. “Who’s lucky?” asked a husky voice over my shoulder. My ears tingled. My heart raced. It was Michael Lawrence, the one true love of my life—peanut butter to my jelly, Mario to my Luigi, Romeo to my Juliet! “Hey,” I said coolly, revealing nothing of the drama going on inside my heart. “Ready to go to the meeting?” he asked. Hailey slumped in her seat and did a fake pout. “You’re always stealing her from me!” she whined. “Hey, I can’t help it if I’m charming!” joked Michael. “Duty calls,” I said in a resigned voice, standing up and gathering my things. “Duty?” said Michael, mock outraged. Hailey and I exchanged a private smile. She knew there was nothing I’d rather do than hang out with Michael Lawrence, and she is pretty much okay with that. I looked up. It was Molly Grant, a seventh grader I know a little. I felt immediately better. As much as Hailey doesn’t mind me taking off, at least now I wouldn’t be leaving her at the table all alone. “I think she seems nice,” I said, because I do. “Hmm. I don’t blame you, but I can’t really get into this now.” I glanced at Michael, who was waiting in the cafeteria doorway. He was chatting with Kate Bigley, whom I always worry he secretly likes. “More on this later. Gotta go. Sorry,” I said. I smiled and raced off.